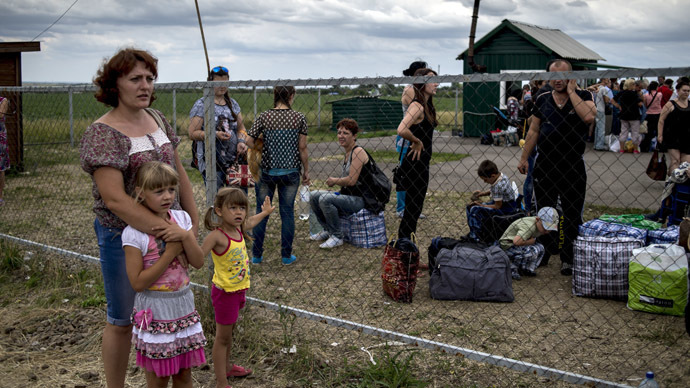 As Ukrainian President Petro Poroshenko confirmed plans to “liberate” the eastern cities of Lugansk and Donetsk, the two biggest towns in the country’s east fear that if sieges develop they will have a major humanitarian crisis on their hands. 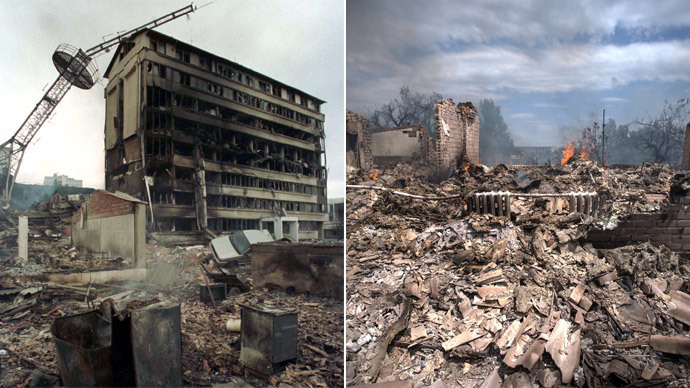 Although the authorities in Kiev claim they are not targeting residential areas, the fact is that ordinary civilians continue to be caught in the attacks. “I built this with my bare hands and now this has happened. 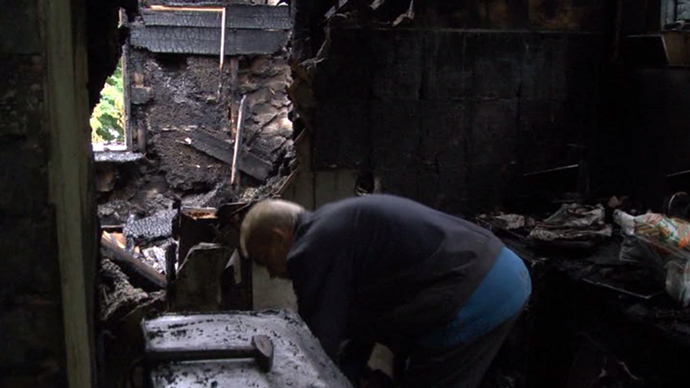 So what am I supposed to do now?” a Lugansk resident told RT, as he inspected the ruins of his shelled house. The RT video shows a completely destroyed building with broken windows and caved-in roof. “Build my house again from scratch? Or is it time for me to die? Go ahead – just keep bombing us…” he added. Local residents who have remained in Lugansk – a city that used to be home to nearly 450,000 people - are worrying about humanitarian issues: food, water supplies and electricity are scarce in the besieged city, reported RT’s Maria Finoshina, adding that it is unclear how local hospitals and medical institutions will be able to function in Donetsk and Lugansk during a siege. 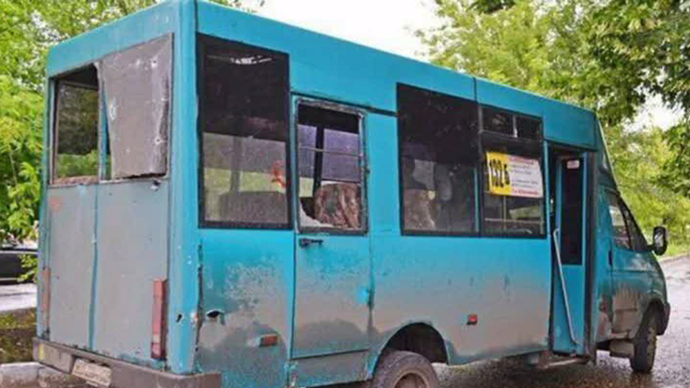 On Tuesday morning, a mini bus in the center of Lugansk was hit by artillery fire, said Lugansk city council’s press service. Two people died in the attack and eight were injured. 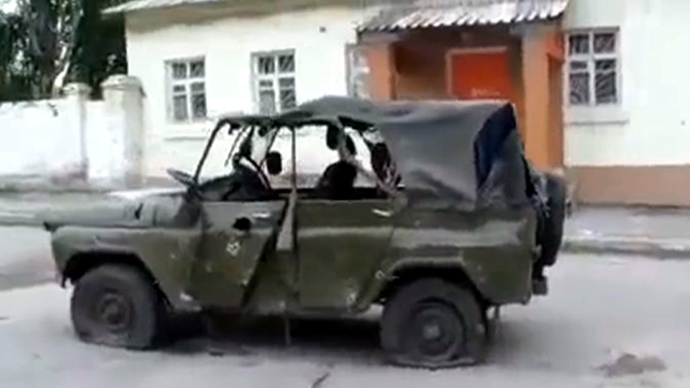 According to Ukraine’s National Security and Defense Council, eight people were wounded in the assault. After the minibus attack, bombs fell in the same street hitting a residential block, reported local witnesses on the scene. The shell struck the roof of the building. Videos released on the internet show a building with a destroyed roof and rescuers from the emergency ministry trying to help the injured. Meanwhile, residents in Lugansk are running out of drinking water. The RT video depicts people coming with plastic bottles to get water. Another city on Poroshenko’s liberation list is Donetsk, with a population of about a million people. 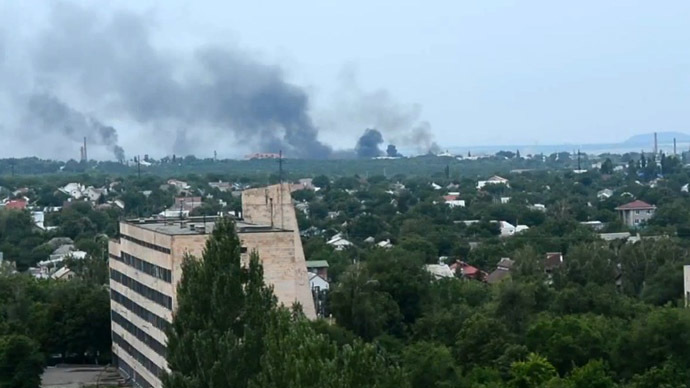 On Tuesday, several dozen armed people seized the ground floor of a large hospital in Donetsk, the local administration said on its website. It was not immediately clear who the people were and what they wanted. 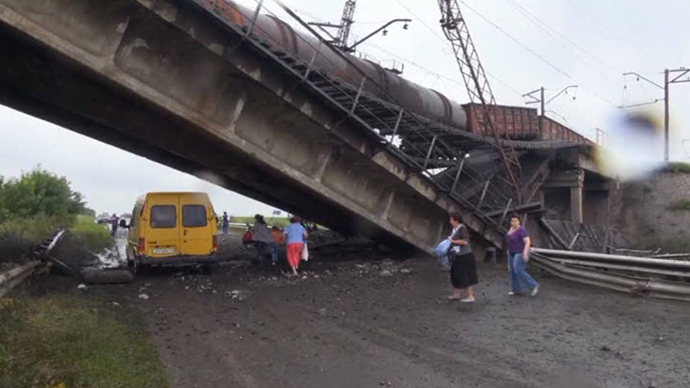 Also a railroad bridge was blown up in the Donetsk Region on Monday. The bridge was a link to major cities, including besieged Slavyansk, the capital of Donetsk and Mariupol. On Monday evening, Ukraine’s President Petro Poroshenko confirmed plans to “liberate” the eastern cities of Lugansk and Donetsk, currently under the control of self-defense forces, Deputy Secretary of the National Security Council Mikhail Koval said. “The Commander-in-chief has approved a plan that covers all phases of liberating our land from those who are destabilizing the situation there,” he said, adding that the Ukrainian president also supported the plan of ‘sweeping away’ all ‘separatists’ in the Donbas Region. In the meantime, newly-appointed Ukrainian Defense Minister Valery Geletey said that Kiev will not declare a new ceasefire in eastern Ukraine unless the militias surrender their weapons. “The president of Ukraine stated this in definitive terms. Now any negotiation is only possible after the militants lay down all arms,” he said.